Scott: Please give your name, company name, title, and preferred contact method. Miroslav: "My business name is Dr. Miroslav Koudelka, otherwise I go by the name of Mirek. I have a master's degree in Teaching Czech and History and a higher degree in Czechoslovak History. I studied English, too. Preferred contact method -- certainly, personal; otherwise email: mk [at] czechfamily [dot] com"
Scott: What is your genealogical specialty and how did you come to it? Miroslav: "A combination of archival research for my clients and then guiding them on their ancestral trips. Genealogy -- for someone is rather 'dusty,' referring to people dead long time ago -- in those cases it becomes excitingly live, personal, emotional. One can stand on the same ground the ancestors stood on, walk the same way down the street, have the same views of the valley, hills, woods, spend a silent minute in the same church etc -- simply, inhale the atmosphere, especially if the trip is preceded with my 'field search' for living relatives. Then the clients have a chance to meet newly discovered Czech cousins, visit their homes, see the way they live, talk about their life stories, troubles and happiness. And they have always said that it was the highlight of the trip and all the years of their genealogy endeavor." Scott: How long have you been focused on genealogy in your career? Miroslav: "For about two decades. At first it was just a hobby, of course. As a historian I was interested in my own ancestry. Besides, English as a foreign language was a long-time hobby of mine -- for example, when I went to perform mandatory military service, I took a textbook, English for the Self-Taught with me and it helped me mentally survive that difficult year. And when, after the fundamental political changes in our country, I learned about the Czechoslovak Genealogical Society International, I saw a great chance to combine those two hobbies, doing genealogical research and being in contact with English speaking persons. So genealogy became my part-time job, and in less than two years, full-time." Scott: What was it like to translate such an important work as Jan Habenicht's book, The History of Czechs in America from Czech to English? Miroslav: "Oh, very hard and very nice. It was a brick hanging from my neck for about two years. First of all, the amount of text itself: The translation made more than eleven hundred standard pages. And we have to realize that it was written more than a century ago and the language was somewhat different in that period. Besides, some of the historical expressions used in the book were difficult to translate because the phenomena themselves do not occur in our society. Using various kinds of dictionaries and history books was not enough, I consulted English Department professors of Palack University, experts working for the Moravian Roman-Catholic Archdiocese and some more institutions. In addition, the original Czech edition was not provided with indexes. So I assumed the task to make them because a book of that kind, intended namely for genealogists and yet missing personal and town/village indexes, that would be inefficient." "But I have been very proud and pleased that I was given a chance to translate that grand book. And then, after the translation was completed, on one of my trips to Chicago I looked up Jan Habenicht's burial place at the Bohemian National Cemetery and put a flower there to thank him for the great work he had done." Scott: What is your favorite part of genealogy? Miroslav: "Researching of birth, marriage and death records. And the moments when dry data put next to one another start matching. Then we can look behind the curtain and see the persons' life stories." "Let me give you a very personal example. My grandfather served in World War I. He was seriously wounded -- a shot left a three-inch scar on the left half of his skull. When he got thru the worst stage, in June 1916 he got a leave to recover and came home. And nine months later on, my mother was born. In other words, if the bullet had gone, let us say, a millimeter to the left, grandpa would have been dead and I could not have been born. And if the bullet had gone just a millimeter to the right, the wound would not have been so serious, he would not have got the leave, and as a result, I would not have been here either… Isn't that exciting? That personal discovery made me write an article in which I actually thanked the unknown Russian soldier for a precisely aimed shot. The whole story can be found in the book Czechs in Uniform recently published by the Texas Czech Genealogical Society." Scott: What do you think about the explosion in the popularity of genealogy? Miroslav: "It is certainly good. And I am not saying it just as a genealogist, but as a human being, too, because, let me say, genealogy has a deeper moral aspect as well. It teaches us humility, it gives us a chance to realize that we are not the only ones in this world, that we are grateful to many others, that we can fly with our heads high in the skies, but our roots are deep in the ground." Scott: What do you, personally, think the 'next big thing' might be in genealogy? 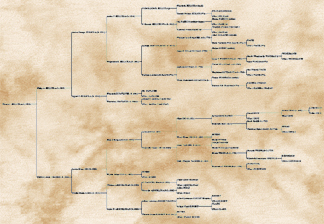 Miroslav: "Well, the 'next big thing' in genealogy has already been happening, I think. Current technology is a real revolution, namely in such a conservative science like history. I say that genealogy has made 'one giant leap' from a coal shovel to the Internet in the most recent two decades, at least in our country. I still remember the old-style stoves from the times when I started going to the archives. When the research room got cold, you could simply go and stoke the stove with another shovel of coal. And today you can find scanned copies of the records on the Internet." Scott: Do you still spend time on your personal genealogy/family history? Miroslav: "Not too much, unfortunately. I am a good example of a saying we have in Czech about the blacksmith's horse walking barefooted (in English it is about cobbler's wife's shoes). Since the beginning of my career as a professional genealogist, my own family history research has slowed down rapidly, I have been always busy working for others. I hope, when I retire one day." Scott: If you had a magic wand and could make one genealogy dream come true, what would that be for Miroslav Koudelka? Miroslav: "To learn where one of my ancestors was born. I have his marriage record saying where he was from and how old he was at the time of marriage, however, he is not either there nor in the neighborhood." Scott: We all have our pet peeves. What is your pet peeve with genealogy? Miroslav: "Bureaucratic obstacles we have with research of relatively young records. To protect personal data of persons possibly still alive, birth records younger than 100 years and marriage and death records younger than 75 years are confidential in our country. But if there is a register covering, let us say, the period 1850-1912, the whole book is under those special rules because of that one year. Making those other 61 years accessible to the public has not been solved a reasonable way yet." "Once I even had troubles to get to death records from the late 1700's because the register contained the period 1784-1949. I was told that death records from the 1790's were still alive." Scott: What is the most fun you have ever had with genealogy? Miroslav: "Well, funny definitely was the statement mentioned above that death records two centuries old might referring to persons still alive. But that is a somewhat bitter kind of fun." "Otherwise, it is a whole series of events and situations. Always, whenever I turn a register page -- and the searched-for record is there. When I introduce my clients to the ancestral home and see how excited they are. It gives you a good deal of satisfaction." "And funny are some of the records referring to the cause of death: In the past it was nothing but their best guess and so they often wrote down just 'old age.' But I found records saying 'ordinarily' -- simply, the person died the way people used to die, and that was it." Scott: What have I missed that you would like folks to know about you, your work, etc? Miroslav: "I am fluent in Czech, English and Slovak, understanding, to a certain degree, German, Latin and Russian. Happily married for 34 years, with one daughter. Live in the historic city of Olomouc, Czech Republic, love mushroom hunting, soccer and drink a glass of good Moravian wine with my wife or a pint of 'fair ' (;-) Czech beer." "And if anyone has any more questions to me, that's a great excuse for you to take a trip to The Heart of Europe and ask me personally . Or, in the meantime, you can visit my website www.czechfamily.com." Scott: Thank you, so very much, Miroslav! We all appreciate your time and you know what? I have so many more questions, I think I had just better take you up on your offer and come on over! I'd love to walk the streets of Rataje, Milevsko, and Nenacovice with you!